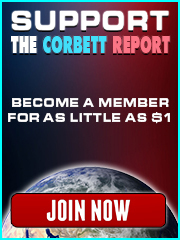 This article originally appeared in The Corbett Report Subscriber newsletter on August 23, 2014. 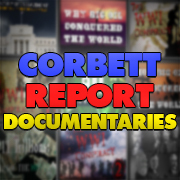 To subscribe to the newsletter and become a member of The Corbett Report website, please sign up for a monthly or annual membership here. Last week we attempted to dispel some of the confusion surrounding the World Bank and the IMF, how the two are differentiated, and what the World Bank actually does. As you’ll recall, Bretton Woods architect John Maynard Keynes admitted that the confusion over the bodies was embedded in their names; the World Bank should rightly be referred to as a fund (for development projects) and the International Monetary Fund as a bank (to help countries cover balance of payment deficits and ensure financial stability). The World Bank itself is a body that ostensibly provides long-term low interest or no interest loans secured on the global bond market to fund sectoral reforms and infrastructure development projects in some of the poorest countries in the world. As we saw last week, however, the Bank is used as a weapon by the economic hitmen identified by John Perkins and others, directing infrastructure development funds to crony corporations and forcing countries into debt obligations that they will be unable to meet. These impossible debt obligations are then used to give the Bank leverage over the developing world economically and geopolitically. What’s more, both the IMF and the World Bank have historically been controlled by the US and Europe, and clamors for reform in governance from the developing countries have fallen on deaf ears. It is in the context of this IMF/World Bank stranglehold over the global financial architecture that we have to understand the stunning development that took place at the 6th BRICS (Brazil, Russia, India, China, South Africa) Summit in Fortaleza, Brazil last month: the creation of a New Development Bank (NDB) to compete with the World Bank in providing funds for infrastructure development to developing nations and the creation of a Contingency Reserve Arrangement (CRA) to compete with the IMF in providing liquidity protection to countries with balance of payment difficulties. 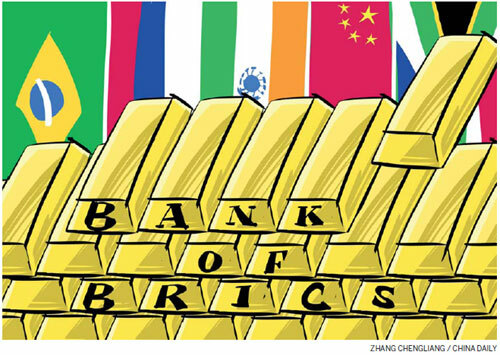 The development was by no means surprising: the idea for a BRICS development bank has been bandied about for years now and was written about in the pages of this newsletter extensively last year. Nor does it represent (at least at this point) a fundamental challenge to the World Bank or IMF’s dominance; neither the NDB’s $50 billion USD in subscribed capital nor the CRA’s $100 billion liquidity pool come close to the World Bank’s $232.8 billion in subscribed capital or the IMF’s $755 billion in liquidity ($1.4 trillion if you include emergency funds). Neither do they have the infrastructure yet in place to coordinate and deploy these funds, nor a track record of working with the world’s poorest countries to ensure that funds reach their intended targets and not the Swiss bank accounts of corrupt politicians and middlemen. Still, there is something of a revolutionary feel to the obligatory pictures of the smiling BRICS leaders coming out of this year’s summit. This year the smiles do not seem quite as forced. Perhaps they even seem a little self-assured. It may be a baby step, but after all it is a step toward a world where the poorest countries do not have to turn cap in hand to the IMF or World Bank for financial aid. But what are the implications of this for the developing countries themselves and the prospect of genuine development? 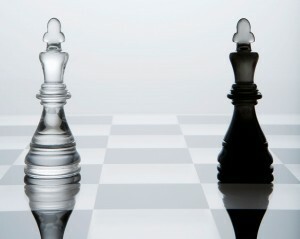 What does this development say about the BRICS and their growing ambition on the world geopolitical stage? And where does this fit into the age-old banker quest for global government? To answer these questions, we must first examine the institutions in question. 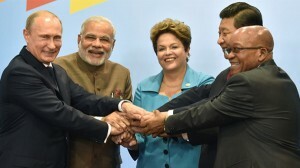 Under the terms of the Agreement signed by the BRICS leaders at Fortaleza, the New Development Bank’s mandate is to “mobilize resources for infrastructure and sustainable development projects in BRICS and other emerging economies and developing countries.” To accomplish this goal they will “support public or private projects through loans, guarantees, equity participation and other financial instruments.” The initial subscribed capital of $50 billion will come from initial payments of $10 billion from each of the five BRICS members. Total authorized capital of the Bank will be $100 billion. Membership of the bank will be open to all members of the United Nations and each members’ voting power will be equal to its subscribed shares in the Bank’s capital stock. The Bank will be headquartered in Shanghai and its governance will consist of a Board of Governors, a Board of Directors and a President. The Contingent Reserve Arrangement, meanwhile, “is a framework for the provision of support through liquidity and precautionary instruments in response to actual or potential short-term balance of payments pressures.” Its initial $100 billion in committed resources will come in tranches: 41% from China, 18% each from Russia, India and Brazil, and 5% from South Africa. Governance of the CRA will consist of a Governing Council including one Governor and one Alternate Governor appointed by each of the five parties and a Standing Committee consisting of one Director and one Alternate Director appointed by each party. The Arrangement’s two main instruments will be a liquidity instrument for providing funds in response to balance of payment problems and a precautionary instrument for permitting access to funds ahead of anticipated balance of payment problems. So what does this all mean? Is this the first salvo in the long-expected economic war between the developed world and the developing world? 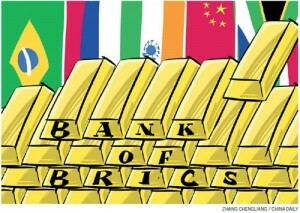 Does the creation of the NDB and the CRA mark the rise of the BRICS as a force on the world stage? Does it threaten the existing IMF/World Bank empire? 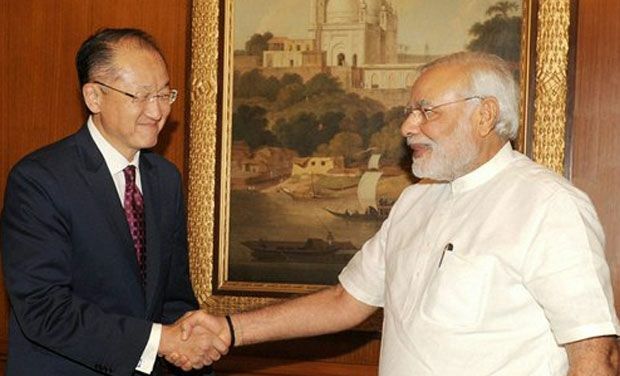 But behind the polite words and ‘we’re all working toward the same goal’ rhetoric is the cold fact that the developing world has been increasingly vocal about their interest in World Bank reform in recent years and specific complaints from the BRICS nations themselves over the strings that are inevitably attached to World Bank lending. It is also perhaps significant that all of the BRICS nations except China will be paying more into their capitalization of the NDB than they do to the World Bank. For those who understand that the IMF/World Bank system is and has been used to subjugate debtor nations and impose the will of the Western powers on those countries, this seems like a potentially transformative moment. 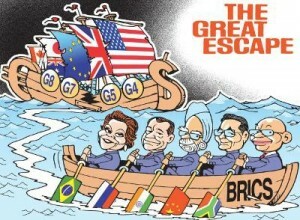 Could it be that the BRICS nations are creating a global institution that will truly undermine the Washington consensus stranglehold over the global south? Are the BRICS creating a global institution we can get behind? Should we be happy about this potential NDB/CRA revolution? Like with so many other situations, we must be careful not to fall into the trap of believing that the only alternatives that are being presented to us are the only alternatives that are possible. In this case, it seems that we are being presented with the choice between supporting a development paradigm led by the ‘bad’ globalists of the IMF/World Bank crowd that seek to control other countries through financing and the ‘good’ globalists who are selflessly looking to spur development for the good of humanity. This is just such a false choice. First, the underlying assumption that the BRICS countries are doing what they’re doing out of some selfless love of humanity needs to be confronted head on. The BRICS countries in general, and China in particular (which is the strongest proponent of the anti-interventionist stance), have much to gain by offering no strings development loans. This was made clear by Gaddafi when he made the argument that China would beat out the US for control over Africa because it’s non-interventionist foreign policy was better at winning Africans hearts and minds. China is interested in securing African resources. It cannot challenge the US directly at its leverage-and-threats approach to gaining control of those resources, so it plays the good cop in the good cop / bad cop game. This allows it to create deep (and lucrative) ties with precisely those nations, such as Sudan, that the US is most interested in ‘reforming.’ It may be a mutually beneficial relationship, but let’s not kid ourselves that China is interested in building up Sudanese infrastructure out of sheer goodwill. Did China finance the construction of a $1.3 billion railway from Khartoum to Port Sudan because they care about Africans or because they care about establishing the infrastructure to service their 2 million ton oil terminal in the port? Secondly, the idea that the BRICS are creating a ‘good’ globalist institution rests on the further assumption that, even if the current batch of BRICS leaders are benevolent and altruistic, that the next batch (or the one after that…) will be as well. The World Bank, too, started out as a humble institution making very limited loans for very specific projects. It wasn’t until Robert McNamara took the reins of the Bank in 1968 that it started to take on the characteristics that we recognize today. Similarly who is to say that the BRICS leaders (or their successors) won’t allow the potential power of being a global financing body go to their heads? Why should we trust that any sprawling globalist institution will act always and forever in the interests of the greater good? No, the ‘good’ globalization / ‘bad’ globalization here seems like a ruse to further globalization. Whether the world comes to accept a greater reliance on and submission of sovereignty to globalist institutions led by the West or institutions led by the BRICS countries does not seem to be a genuine choice. So what are the alternatives? Surely it is important to build up the infrastructure of the developing countries, isn’t it? Surely this can’t be accomplished without the massive resources of a World Bank or a New Development Bank, can it? It should first of all be noted that the urge to assume that developing nations cannot possibly find solutions to their own infrastructure and development problems without the aid of the rich global power players is not only paternalistic and patronizing, but contra-indicated by the evidence at hand. What, precisely, has the last 50 years of World Bank/IMF intervention and “aid” to the developing world achieved, exactly? Is Argentina in a better position than it was before IMF intervention, or a worse one? Has sub-Saharan Africa improved its political and economic clout on the world stage as a result of its World Bank financing, or become even more subservient to the countries that have provided it those loans? Are the success stories of economies that have risen out of poverty like South Korea because of or despite IMF/World Bank meddling? The answers to these questions, all easily enough documentable, speak for themselves. Also, it shows a profound lack of imagination to believe that funding can only come through mega-grants delivered by bodies with hundreds of billions of dollars at their disposal. In recent decades the concept of microcredit has transformed our understanding of what is possible in terms of funding business and enterprise in the developing world, and it is currently challenging assumptions that infrastructure like affordable housing and sanitation systems can only be provided by the “grant aid lottery” of the World Bank (or NDB). Local communities know best what local needs are and how local manpower, resources and services can be organized to meet those needs. Granting bodies in Washington or Shanghai cannot possibly be expected to have that type of knowledge, or expect that throwing dollars at these problems will achieve the same results as providing small-scale, goal driven aid for specific local projects created and run by local community organizations. It is not a question of ‘good’ global banks vs. ‘bad’ global banks. It is global banks versus the people, as it always has been, and when we understand the situation from that perspective the sheen comes off of the ballyhoo surrounding the New Development Bank. Before anyone gets too carried away with speculation about the NDB and the CRA and their likely role on the world stage, it would be good to conduct a brief reality check. There was another announcement of another alternative development bank just a few short years ago that received a similar amount of coverage and hoopla at the time that turned out to be all talk and no action. Remember the Bank of the South? Neither do most of the people who wrote about it at the time, and yet it seemed like a major development when it occurred. That the BRICS are serious about following through with the NDB and the CRA is not in doubt, but that they can keep these organizations together and working toward a unified vision is very much doubtful at this moment. Internal divisions within the BRICS delayed the creation of the bank for years and even now tensions continue between the members. Brazil and China, for example, remain locked in disputes over China’s economic relation to the South American country; Brazil accuses the rising dragon of plundering their resources and dumping cheap manufactured goods on the country in return. China and India have also butted heads over control of the NDB’s policies and vision, and there is ongoing concern about whether South Africa will be able to live up to its financial obligations in these institutions. All of this being said, the bank is hoping to make its first loan in 2016. When that happens, there will be no doubt that we will be living in a different world. The question is whether it will be a better one.